Ellis Faas’s set for May is here! Specifically created for the fabulous month of May containing three main products to help you create this amazing look. 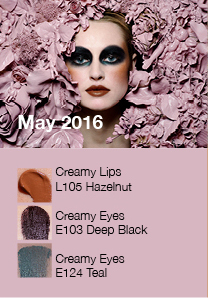 Including creamy lips in Hazelnut, creamy eyes in Deep Black and Teal. For more information on the products we offer, click here. If you are interested in achieving this look, contact Katrina today!